We will discuss your current dental concerns and your overall health/wellness profile during our Comprehensive New Patient Exam. As a part of the exam we do a thorough clinical exam of teeth and gums, digital x-rays, a Cone Beam CT and oral cancer screening. Dr. Beard and her staff greatly value the relationships we build with our patients. Your initial comprehensive exam will be comprised of a thorough medical and dental history. We will discuss your current dental concerns and your overall health/wellness profile. As a part of the exam we do a thorough clinical exam of teeth and gums, digital x-rays, a Cone Beam CT and oral cancer screening. Please plan 2 hours for your initial visit. After careful study and evaluation we consult with you so you have a complete understanding of your dental condition and circumstances. We want to give you the most accurate information possible so you can make important decisions most appropriate for you. We will offer treatment choices, tailor an individual treatment plan that addresses both your dental and medical needs and desires. Dr Beard only places resin composite fillings. This material is a tooth colored metal-free material. Resin composite is much more esthetic and safe than a silver filling (mercury amalgam). There is no release or “leak” of toxic or potentially harmful chemicals from resin composite. The material is bonded to to the tooth to form a tight seal between tooth and filling. Mercury is the most toxic, non-radioactive element on the earth. Published research demonstrates that mercury is more toxic than lead, cadmium or arsenic. Mercury accumulates in the body with long term low level exposure. NO amount of exposure to mercury can be considered harmless. We follow IAOMT’s SMART (Safe Mercury Amalgam Removal Technique) technique when removing amalgam fillings. The patient is given a slurry of charcoal, chlorella, or similar adsorbent to rinse and swallow before the procedure. Protective gowns and covers for the dentist, dental personnel, and the patient are worn during the procedure. Face shields and hair/head coverings are worn by the patient, dentist and all dental personnel in the room. External air or oxygen delivered via a nasal mask for the patient is utilized to assure the patient does not inhale any mercury vapor or amalgam particulate. A dental dam is placed and properly sealed in the patient’s mouth. During amalgam filling removal, a extra external suction device is used in close proximity to the operating field to mitigate mercury exposure. Once the removal process is complete, the patient’s mouth is thoroughly flushed with water and then rinsed out with a slurry of charcoal, chlorella or similar adsorbent. IAOMT does not recommend amalgam filling removal for women who are pregnant or breast-feeding and that the IAOMT does not recommend that dental personnel who are pregnant or breast-feeding conduct work that disrupts amalgam fillings (including their removal). When a filling is large, roughly 50% of the tooth, the tooth is at great risk of breaking. A crown or onlay (partial crown) can be used to prevent the tooth from fracture and/or needing more invasive treatment. Crowns are also used to repair already broken teeth, to restore them to their original shape and function. They may cover only a portion of the tooth, or the entire tooth. Once cemented permanently in place crowns function and are cleaned the same as a natural tooth. Dr Beard uses the most current, metal free all-ceramic materials, providing a durable, safe and aesthetic outcome. CEREC (Chair-side Economical Restoration of Esthetic Ceramics) uses CAD/CAM technology to allow Dr Beard to prepare, design, manufacture and insert a permanent ceramic crown or onlay in a single visit. NO need for uncomfortable temporary crowns and a second appointment two weeks later to have your permanent crown cemented! With this technology you receive a final restoration the same day! 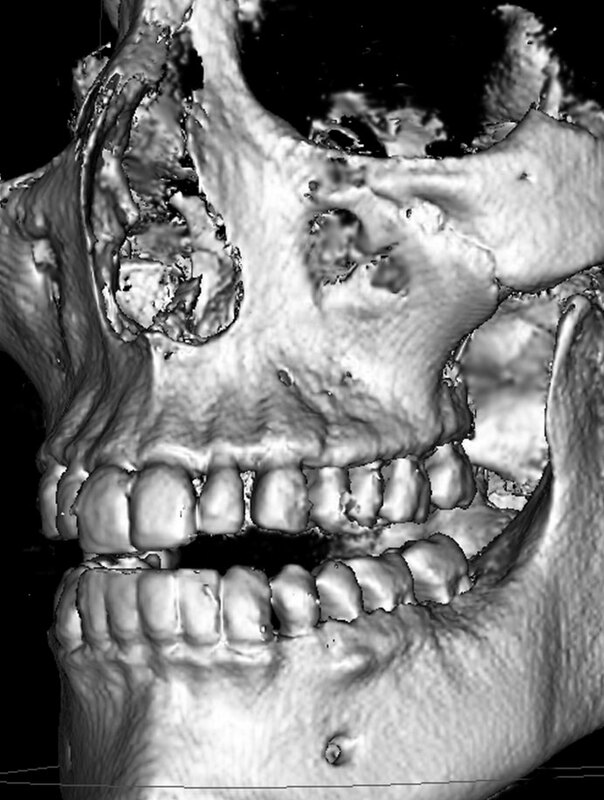 Cone Beam Computed Tomography (CBCT) technology is changing the way dentistry can be delivered. Renew Dental is committed to providing the highest quality care, and we’re proud to use the Sirona 3-D Galileos CBCT Scanner in our practice. This technology allows our team to view and diagnose individuals like never before. Traditional 2-D Xrays still have a place in dentistry, but 3-D imaging can allow for improved planning, earlier diagnosis, more efficient treatment, and it’s pretty cool! • Galileos images are highly detailed, showing both soft and hard tissue without sacrificing clarity. • Galileos CBCT Scanners take less than a minute, are completely painless, and the radiation dose is 100 times less than a traditional CT scanner. • Our doctors can analyze the position and orientation of critical structures, like nerves, teeth roots, previous implants, the sinus, and nose, helping to make implant placement as accurate as possible. • With this advanced imaging technology, we are able to view all teeth, including root canal treated teeth in 3 dimensions to better diagnose infection, fracture and pathology. When it comes to procedures like tooth extraction, our dental team believes that there is no better way to ensure successful outcomes than to use the patient’s own natural growth factors to promote healing. Drs. Beard and Clapp safely extract the tooth, remove the periodontal ligament and any infected tissue and use PRF (platelet rich fibrin) in the socket to advance healing time and post operative comfort. Dental implants are a relatively new method of replacing missing teeth. Implants can be one of the most predictable ways to replace a single tooth, multiple teeth or even used to secure a denture or partial. 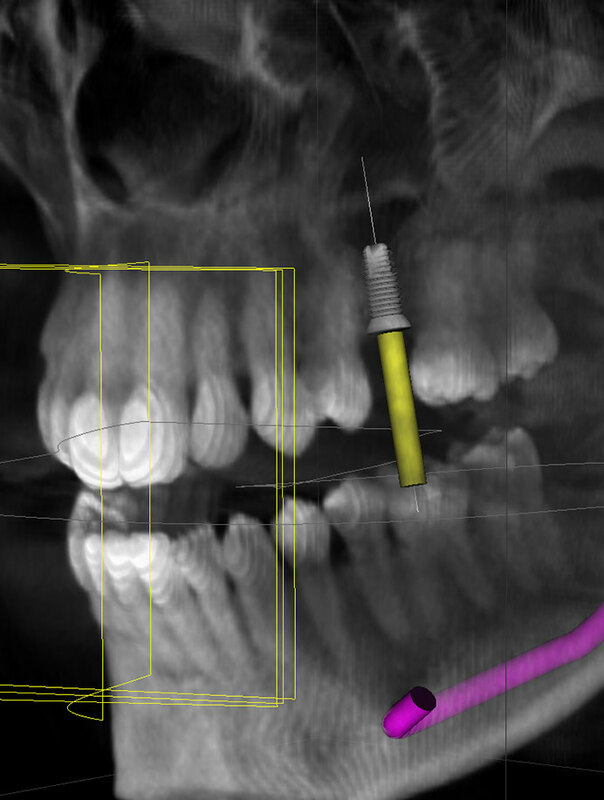 Implants are surgically placed beneath the gums into the jawbone to replace the root of a tooth. After the appropriate healing time the implant is exposed and crown or bridge is attached to the implant and is ready for function! There are many considerations that must be taken into account before this option is discussed, not every patient is a candidate for implants. Our doctors will evaluate the cone beam CT scan for adequate bone amount and quality. The patient’s health history and medications are also strong determinate factors when treatment planning dental implants. Drs Beard and Clapp will discuss the risks and benefits of implants and help you decide if they are right for you. A dental revision is a process in which potentially toxic material and teeth are removed and replaced with biocompatible materials specific to each patient’s individual immune system. These may include removal of mercury amalgam fills, replacement of crowns and bridges that have harmful nickel and other metals, removal of infected root canal treated teeth, dead or infected teeth, and a thorough debridement (cleaning) of jaw bone (jaw bone cavitation) that is dead or infected. The overall purpose of a dental revision is to remove the mouth’s contribution to the body’s overall infection, toxicity and/or inflammatory load. A dental revision can be done all in the same day with or without IV Conscious Sedation or spread over several appointments. Every patient and their immune system is different. A simple blood test is used to determine what materials are appropriate for you. This includes filling and bonding materials, crown and bridge materials, cements, temporary materials and denture materials. A biocompatibility test is a laboratory screening process used to help identify existing sensitivity problems (allergies) in an individual patient to various chemical groups and families of compounds used in dental materials. Knowing ahead of time what the patient’s body can accept provides great assurance to the dentist and the patient that the biomaterial placed will have little or no effect on the patient’s intra-oral and over all inflammatory load. Ozone therapy has been used for many years throughout Europe for the treatment of bacterial, viral and fungal infections. In recent years ozone therapy has been embraced in health centers around the world due to its effectiveness and wide margin of safety. Our doctors have extensive training in ozone therapy and utilizes this therapy frequently because of its painless application, its effectiveness and its lack of harmful side effects. By studying natural healing processes, researchers have discovered Platelet Rich Fibrin (PRF). It has been found to be very effective in helping patients heal after dental surgery. The National Center for Biotechnology Information (NCBI) conducted a study on a group of 56 patients that had undergone tooth removal procedures on the third molar. On the third day, they found that the patients who had PRF inserted into the tooth cavity showed far less swelling as compared to the patients who received conventional treatment. Platelet Rich Fibrin is a pure form of platelets that is from the patient’s own body. The patient’s blood is drawn and put into a centrifuge. PRF it is created by removing the red blood cells that are also present in the blood. The resultant PRF serum is a concentrate of growth factors, stem cells, and cytokines (a kind of protein that passes messages between the cells). PRF also contains white blood cells that protect your body from infections. In short, it is everything your body needs to heal wounds, injuries, and incisions after surgical procedures and nothing foreign, so there is no chance of a sensitivity reaction. Many of these procedures can be carried out while undergoing sedation to ensure your comfort throughout the procedure. Depending on the complexity of the procedure, we may refer you a specialist so that you receive the best and most appropriate care. There are cases where gingival tissue grows over healthy tooth structure and cause the tooth to appear short this over growth can also cause a deeper periodontal pocket (space between your tooth and gum) that can build plaque and tartar and will cause more severe gum infections. In many cases a laser is used to remove this excessive gum tissue to expose beautiful teeth and reduce risk of periodontal disease. This is a simple and commonly painless procedure.